Farmgirl Fare: Saturday Farm Photo: Done! What the hayfield can really use right now is rain, and the half inch that fell yesterday was a welcome gift, especially as we head into several 104° heat index days ahead. I'm behind as usual replying to comments and e-mail, and when I wrote about haying back on June 6th, some of you had the seemingly brilliant suggestion that we enlist a couple of local teenagers to help bring in the hay. I had to laugh at Joe's immediate response when I told him. He said, "We don't even want to do it!" and then added, "Have you ever tried to get a teenager to do anything?" The fact is that picking up hay is one of the toughest, sweatiest jobs on the farm, and nobody likes doing it. It's one of the main reason nearly everyone around here has switched to putting up big round bales—which weigh 500 to 1,500 pounds each, can only be moved with a tractor, and really aren't practical for feeding sheep—instead. Even if you can find somebody willing to help, the cost is prohibitive, at least for us. In a place where a full time job that pays $8 an hour, has little or no benefits, and probably requires physical labor is considered a good find, people want at least two or three times that much to pick up hay. I would go pick up somebody else's hay for that price. We have friends who buy their hay each year 'in the field' because the cost is so much lower. What people used to do around here is share the work of haying. Extended families would help each other put up their square bales of hay, with everyone pitching in their labor and equipment. It was an even trade, and no money had to be exchanged. But nobody we know in this area even puts up square bales anymore. The other thing some of you suggested is that we invest in a Jacuzzi to soak our tired muscles, and thankfully we're way ahead of you on that one. After eight years of slowly but surely working on our new living quarters, we're finally almost ready to move in, and once we do I'll give you a little tour. In the meantime, you can see a few photos, including one of our luxurious new tub (which now has one of those old-fashioned circular shower curtains suspended from the ceiling) here. Just joining us for haying season? 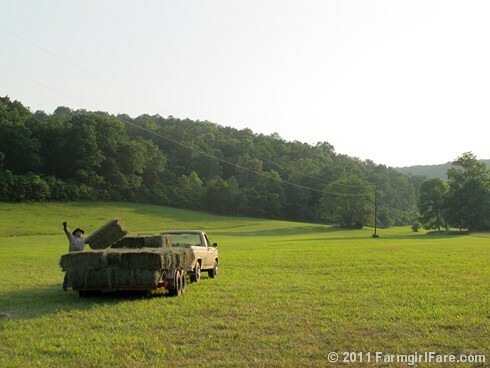 © FarmgirlFare.com, where hay ho, hay ho, it's out of the hayfield we go! Your hay is so very green and wonderful! I love the pictures. If we lived closer, my boys would work for you for $8 an hour. I can't even believe that 13-15 yr.olds wouldn't want that opportunity. We buy square bales for our hen bedding and we have a hard time finding them. I guess this is why. Thanks for visiting my blog and leaving a comment - we like our little jelly maker too. I loved poking around your blog - I'm sure I'll be visiting often. It's the haying, alone, that keeps me from ever fantasizing about your rural, lamby life. Whew! Great job, guys! Kick back and enjoy a cold glass of iced tea! Congratulations, well done! I can imagine how much hard work, sweat and blisters were put in. Enjoy your well deserved soak in the jacuzzi. I remember haymaking days from early childhood: family holidays in the Swiss mountains, helping the owner of our holiday home to make hay on impossibly steep fields, we children raked the hay, the sweet smells of hay and alpine flowers on a hot summer day and the reward: cool herbal tea (wonder how they cooled it as there was no electricity up in the mountains at that time yet), it was so delicious, only later did I know that I was laced with wine! And later in my teenage years we did some community service and were on a farm in the Jura region: huge fields of hay, we had to tear out some red stemmed weed, at the end of one row I was sneezing like never before and felt dizzy like after a rollercoaster ride. I was banned to the kitchen garden to bring it in order (that is another story). So, I guess I have some competence in haymaking ... kudos to you! Enjoy a lazy Sunday then and I look forward to reading more from your farm and garden and I cannot wait to be taken on that tour of your new house. Whew! Excellent news. Congratulations on a yucky job, verrry well done! We've actually been doing a lot over there already - using the tub/shower, the laundry is over there, the pantry is all set up and full, etc. As soon as we can get the guy out to do the final hook up on the a/c units upstairs (a/c! ), we'll be moving the bed! I've been making sun tea with lots of fresh mint leaves. Tall glass, plenty of ice, so good! Is Hunky Farm Guy raising his arms is a hearty cheer??? Congratulations on all your 'hay baling' success! Seriously, I think we all wish we could help you out a bit - such truly hard work!! We are so looking forward to the tour of your new home - I think you two really deserve a few extra comforts!! Yeaaaaa!! Glad you got the haying done without major mishap! I really need a Bert fix. Thank you in advance for your attention to this matter. In totaly understand about all the hard work that goes into putting hay up. We do ours lose. We cut, rake, haul, and stack our with horses!! It should work out for another cutting. We just sprigged ours and they said we should be one cutting before frost. Teenagers would be a pain to deal with. Agri-tourist-labor? Some "working farm vacation" places seem to be able to get people to pay them to come and be put to work. Perhaps this is an underdeveloped aspect of Missouri tourism. Now, maybe the quality of the help would not be top notch... And their visits may not align with haying weather... And they may take more looking after than the hay they put up is worth. Ok I'm talking myself out of it. Love this and can't wait for the tour! I've been WWOOFing for years and I absolutely love it! Gosh, you are so busy all the time. How do you do it? You done a great job with the hay, and you came out pretty good on it. I bet you're glad that is over with. Now, find some time to kick up your legs if possible. MrC worked on a farm for $8 an hour until he was a sophomore in college. When I suggested we raise our own hay if we ever have a farm, he said "Absolutely not". hee hee. Apparently that's one of the worst jobs on a farm is baling and picking up hay! !